Since 1836, generations of Madrid’s establishment and jeunesse dorée have been quietly inducted into the Casino de Madrid. Housed in a grand old pile in Calle Alcalá, the private members’ club has only ever allowed public access to its restaurants – the rooftop aerie of executive chef Paco Roncero being both the club’s crown jewel and a chance for nosy interlopers to peek into its grand interiors. After 30 years of continuous service, La Terraza del Casino restaurant, a high-ceilinged space comprising a series of bright rooms linked by arched doorways, has become a modern classic. 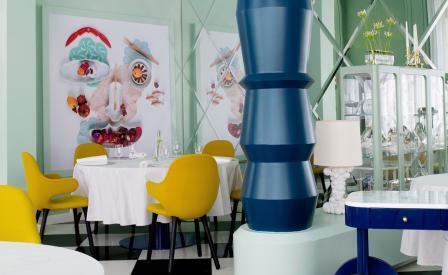 The designer Jaime Hayon who redesigned its interiors 10 years ago has just returned for a spruce-up. In 2007 he intruded lightly on the historic space, injecting quiet moments of youthful levity and humour through his trademark love for geometric shapes. He set the scene at the reception by hanging a chandelier of polished metal and bulbs that, on second glance, morphs into the shape of a smiling face. From there, the Spaniard riffed off harlequin themes with black and white chequered marble floors, coloured glass, and canary yellow seats in a sea of white drapery. For La Terraza del Casino redux, Hayon has brightened the palette considerably, transforming the greys and whites of the original design into a vivid tropical palette of blue and yellow accents set against a pale green interior. New ceramics, vases and objects and banana leaf palms were selected to add energy, combining to create an upbeat sense of glamour.